Hassaké (Agenzia Fides) - In the northeastern Syrian city of Hassake, and the surrounding region of Jazira, Kurdish militias vying for control of the territory with the government army are carrying out acts of violence and intimidation against Christians: this is what Syrian Catholic Archbishop Jacques Behnan Hindo said to Agenzia Fides, reporting a long list of accidents and abuses that in his opinion constitute a genuine strategy aimed at expelling the remaining population of Christian faith from the city. "Whenever the Kurdish militia enter in action to reaffirm its military hegemony over the city" explains the Archbishop, at the head of the Syrian Catholic archieparchy of Hassaké Nisibi, "the epicenter of their raids and acts of force is always the area of the six churches, where most of the Christians live. In many cases they expelled the Christians from their homes under the threat of Kalashnikovs. And where they enter, they loot everything". Archbishop Hindo confides that he was himself a victim of a recent act of intimidation, when some shots of gunfire were fired through the window of his house, and a bullet narrowly missed his head. "At that moment", added the Archbishop, "the area was presided by Kurdish militias, and there were no other armed persons nearby". "For sure" points out Archbishop Hindo "these shots were not fired by jihadists, whose closest bases were located more than twenty kilometers away". 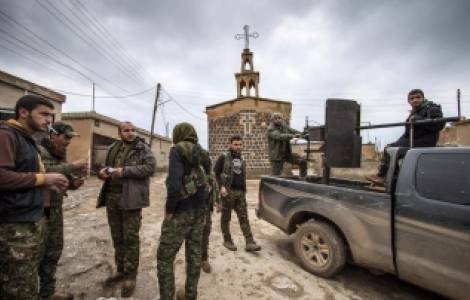 According to the Archbishop, the Kurdish militias initiatives pursue the design to assert its control over the entire city of Hassaké, then consolidate their supremacy over the whole region, to the detriment of the government armed forces.